Circuit City originally opened as Wards (completely unrelated to Montgomery Wards) in 1949 in Richmond, Virginia. The chain which originally sold appliances, jumped into the new market of television sales. In 1984 Wards officially changed their name to Circuit City and was listed on The New York Stock Exchange. Circuit City continued to grow and expand their chain. They were known for having exceptional service, although sometimes being a bit pricey. By the early 2000s Circuit City’s locations were beginning to become outdated when compared to the competition. The company decided to move away from their bread and butter which had been the large appliance business and focus more on consumer electronics. This shift in focus was initially quite successful. However, as online shopping started to become common place Circuit City began to take a hit in business. The items which had become their focus, general electronics, could often be bought online for a fraction of the price of the in store items. More and more business took place online. Still many new locations were planned and being built, when the company unexpectedly announced their intent to close a majority of their stores in 2008, with the closing of final locations taking place in early 2009. Circuit City was a late comer to the Houston area. The first stores to open in Houston did not begin operating until August 29, 1991. These six stores were as follows: Almeda, Baybrook, Greenspoint, Sharpstown, West Oaks and Willowbrook. While in terms of electronics super stores 1991 is a late start date, Circuit City beat Best Buy to the area, by over a year. Circuit City had a good run in Houston. Most of the stores were smaller format stores common in the 1990s. 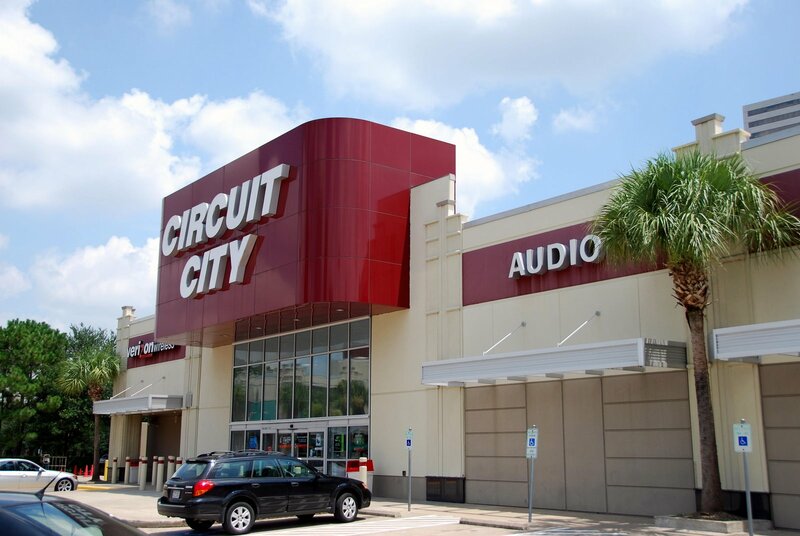 Throughout the early and mid 2000s Circuit City began to expand and upgrade the Houston stores. Some locations were remodeled, while others were replaced all together. At the time of the 2008 closure announcement Circuit City was still considered a major brand. However, high prices, unhelpful sales staff, and a less competitive business model led to these stores falling to the wayside. The former Circuit City on San Felipe at 610. Now an Ashley Home Furniture Location. Below is a table containing all locations in Houston at the time of bankruptcy, their addresses, and notes on what replaced them. 538 10025 Almeda Genoa Road Houston, TX Newer Location, Sat Vacant until after 2011, Replaced by a Conn's Home Plus. 3233 4500 San Felipe Street Houston, TX Now Ashley Home Furniture, former audio installation bays still visible. 3815 5000 Katy Mills Circle Katy, TX Katy Mills Mall location called "The City" had opened less than a year before now a Ross. 3579 100 Meyerland Plaza Mall Houston, TX Part of Meyerland Plaza, now a Best Buy. 3520 13350 East Freeway Houston, TX Was originally subdivided with Academy, which has expanded into former CC space. 541 1280 Highway 6 S Houston, TX Sat vacant until around 2014, replaced by Goody Goody Liquor Store. 542 17727 Tomball Parkway, Houston, TX Newer Location, Replaced by Ashley Furniture. I worked seasonal at the San Felipe store in Houston the year XBox 360 debuted. It was around black friday and complete pandemonium. One morning we opened the store early after being surprised by the late Barbara Bush. The employees were hurrying to their stations, hoping to catch a glimpse. It was a surreal experience. Hard to believe these stores are all gone now. She lived right up 610! I’ve heard that the Bush family would shop at Rice Epicurean. Although, I’m not sure how much truth there is to that. The Katy Mills location never opened its doors. It was completed but never opened. Very interesting, any more information on the location? It’s scarce on the net. Construction was completed but they filed for bankruptcy before they could open the doors. There used to be a circuit city in Pasadena, TX. Bought my TV from them years ago when they were going out of business and TV was still working I just finally upgraded to a bigger screen so its easier on my old eyes at night.